We wrap our soap in fabric so it can breathe and you can smell the gorgeous scents. We only buy organic and Fairtrade - but this is about more than labels - it makes a real difference to people's lives. The organic cotton is grown and woven by hand in K. V. Kuppam, a small village situated in the south Indian state of Tamil Nadu. The Fairtrade partnership has meant vast improvements for life in the village. Many of the workers in the tailoring societies are women, with earnings equal to men. 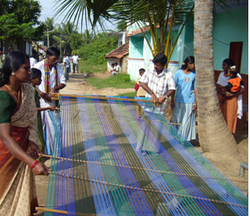 The weavers work from home, weaving on a traditional handloom which is passed down through generations. 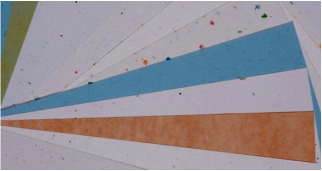 The paper we use for labels is 100% recycled using post consumer waste collected from schools and offices in the UK. It has no bleaches, detergents or acids in any of the paper and it is all made in the UK. See if you can spot that little something extra added... Ellie Poo paper (made with elephant dung), or Rhino poo paper (made with Rhino dung), grass, straw, bank note, banana or even denim paper made with recycled jeans from Oxfam. The money from the more "exotic" ingredients funds community projects in those areas. Palm Oil is an edible vegetable oil from the fruit pulp of Oil Palms. I have seen first hand the absolute devastation of Sumatran rainforests (while travelling overland from the UK to Australia) because of deforestation to grow this useful tree. It is in everything from butter spreads to make up and often listed only as vegetable oil. Along with Shea Butter, Olive and Coconut oils it is an essential base ingredient in natural soaps. I have tested soaps without palm and found them to be too soft so instead of boycotting the ingredient I only use fully sustainable palm oil certified by the RSPO (Roundtable on Sustainable Palm Oil). Supermarkets, major food companies and the UK government catering services have also pledged to use only sustainable palm by 2015.